I was about to use the word "wartime" in the above heading, but unfortunately we have had a few more wars since 1943. The federal Office of Defense Transportation was seriously interested in saving tires and gasoline for the war effort in May of 1943. This concern shows up in several New York Times articles, one of which I link below. This article is more informative than others because it gives an idea of bus service in the five boroughs of New York and the Sunday cutbacks that were ordered. I have encountered other stories of 1943 cutbacks and other hints of cutbacks. Apartment complexes in the outer Bronx and Westchester were providing buses to nearby rail stations; the ODT ordered them to cease. Presumably, one should walk to the train. In another instance that I have only partially uncovered, some bus companies providing service across the George Washington Bridge were told to drop their passengers at a train station in NJ. The above link is a long article, and you can move to the page on which it continues. I guessed there might be modifications to the announcement of May 30, 1943. Orchard Beach was Robert Moses's beach, and I didn't think the no-bus rule would stand. No one, even Moses, wanted more private cars violating gasoline trip rules and various rationing by a different federal agency, the Office of Price Administration. The link below is to a page of the New York Times of June 13, 1943, with three articles about bus travel in New York City and rules of the Office of Defense Transportation. Service was restored to Orchard Beach with a shuttle to the subway. Some FACCO and NYO routes were shut down completely. I can remember stores with signs "Closed for the Duration," puzzling me as a kid what a "duration" was. It meant for the Duration of the War. And a few bus routes never did come back from the 1942-43 ODT-mandated service cutbacks. Among the major casualties were FACCO's 9 which traveled from 72nd Street and Central Park West to Washington Square. And wasn't it due to the war's aftermath that the route that began FACCo, 1 - Fifth Avenue, was reduced to once-a-day franchise holder service, terminating south at 42nd Street despite front roll signs indicating "Wash. Square," until its 1962 demise (today's M1, despite its SB path since 2010 following the entire FACCo 1 route between 135th and 8th Streets, is 100% the old NYCO Fourth and Madison Avenues line)? And then there were those that, for the rest of their days, were limited to once-a-day franchise-holder service, such as those of NYCO as 9 - Seventh Avenue and 8th Street (regular service discontinued March 1, 1943, and finally eliminated for good about 1950) and 22 - Pitt and Ridge Streets (regular service eliminated Nov. 30 or Dec. 6, 1942, then held on barely until the 1962 strike against Fifth Avenue Coach Lines and Surface Transit, and did not survive the MaBSTOA takeover). FACCo's 16 - Elmhurst Crosstown was out completely from June 13, 1943 to Nov. 1, 1945. I wonder on what date TB service to Astoria (also ixnayed that 1943 day) came back (I presume after the war), ditto for a section of NYCO's 14 - 14th Street Crosstown stretching from Avenue A to what would later become FDR (then the East River) Drive. 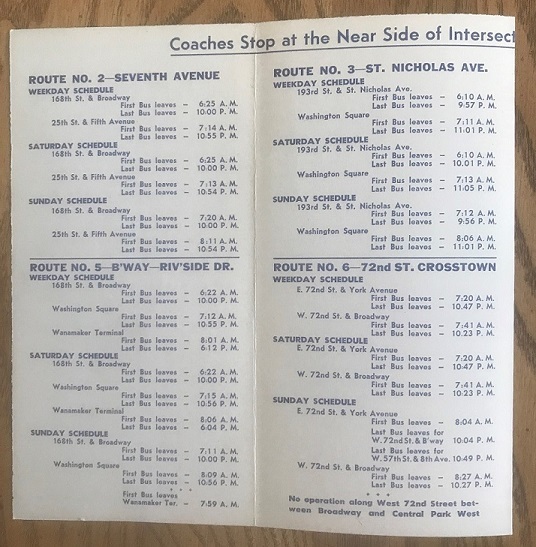 I know that of the Seventh Avenue routes of NYCO, 8 was out completely from June 13 to Aug. 22, 1943 (resumed Aug. 23), as was FACCo's 6 - 72nd Street Crosstown. The 21 - Houston Street and Avenue C line was also eliminated June 13, but resumed as of July 19 on orders from the Public Service Commission. Between June 15 and Aug. 22, 3 - Lexington Avenue was truncated in its northern terminus to 116th Street. 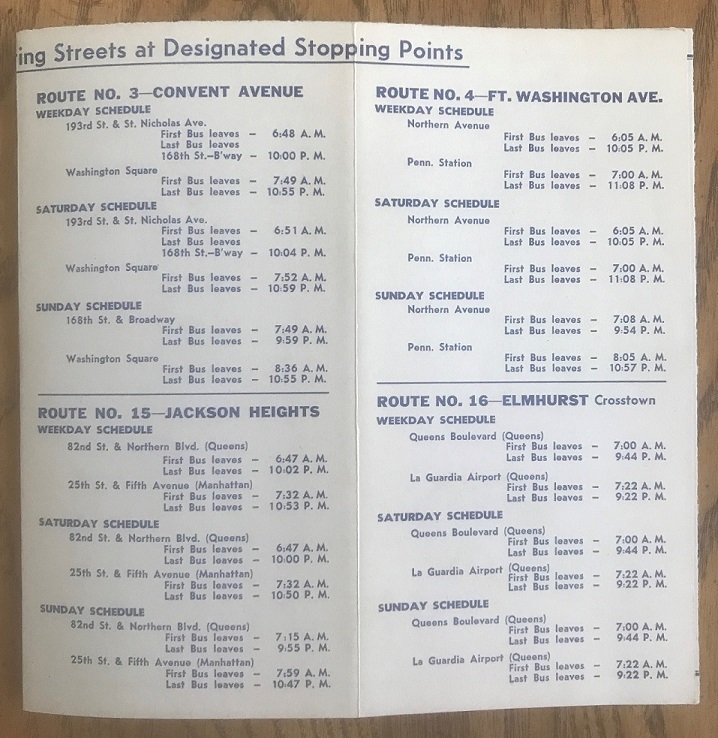 The Surface Transportation network of Bronx bus routes was another can o' worms in figuring out which routes were eliminated "for the duration," and when each came back (one route, Bx-50 Highbridge which was among those the ODT ordered discontinued, would resume after the war as Bx-49). Many thanks to W. B. Fishbowl for investigating further and publishing what you learned. Thanks for sharing. I found the attached pamphlet deep in my collection. For the sake of brevity I'm posting it in as few photos as possible,, therefore the reason why the routes are not in order. 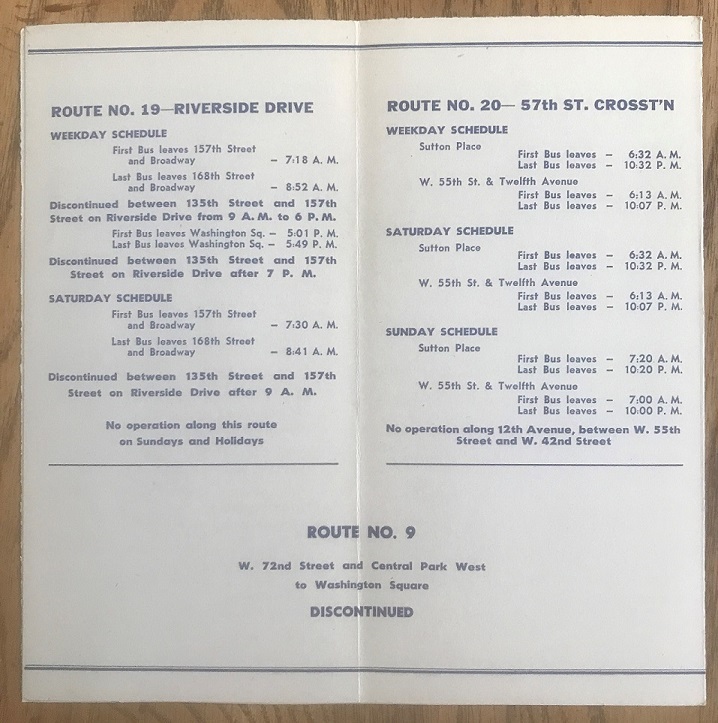 - I don't think I saw that cutback of 6's western terminus from CPW to Broadway in that 1971 Motor Coach Age capsuled description of FACCo routes (9's discontinuance and 20's truncation to 55th and 12 were, though). When would its service to CPW have been resumed? I presume after the war? - It would not be the last time that route would be so truncated; after Sept. 10, 1989, by which it had been known since July 1, 1974 as M30, its western terminus would be cut back even further than that to Columbus Circle and its hours way reduced, especially since a new 72nd Street Crosstown route (M72, which traveled directly along Central Park via the 65th Street Transverse and terminated west at Freedom Place) was first put into service that very same day. - I only saw 2, 3, what would later be designated 3A for internal purposes by MaBSTOA (but never on roll signs), 4, 5, 6, 15, 16, 19 and 20 affected by these ODT-mandated cutbacks on that 1942 day (not to mention 9 being discontinued for what turned out to be permanently); in which of the subsequent wartime cutbacks (March 1943? June 1943?) 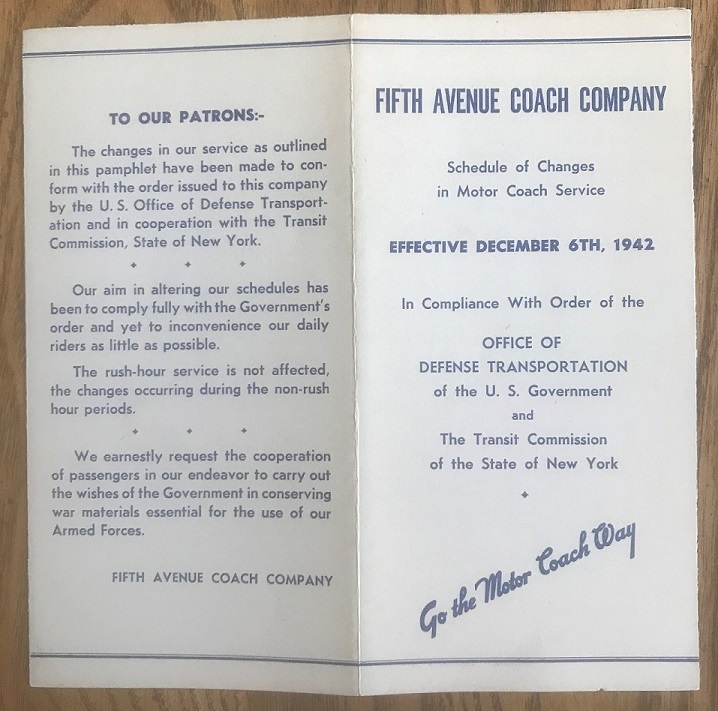 would we have seen their 1 route reduced to once-a-day service, terminating south at 42nd Street despite Washington Square being listed as such on both FACCo's 1947 map and the c.1957 map from Fifth Avenue Coach Lines? I.I.N.M., NYC Omnibus' first round of cutbacks would have been the week before (~Nov. 30), which saw the end of regular service for 22 - Pitt and Ridge Streets (it was officially "discontinued," after the war it would be a once-a-day route until the 1962 strike against Fifth Avenue Coach Lines and Surface Transit which buried it for good) and truncations of the 12 - Spring and Delancey Streets and 21 - Houston Street and Avenue C lines.